Senior year is full of new things and activities that you definitely won’t want to miss. It is the ultimate social and fun school experience! However, it isn’t all about a smaller class load, friends, and events. Your senior year is also a crucial time for college preparation. High schools offer a myriad of options like Advanced Placement, Concurrent Enrollment, and even early college courses in association with local universities and community trade schools. I have found these options to be extremely helpful in my own academic life. When I was in ninth grade, my junior high school decided to add Advanced Placement (or AP) environmental science. At the time this was new and semi-controversial. Why should junior high students be trusted with a college class? They are immature, naive, and don’t know what they are getting themselves into. Parents, counselors, and peers all attempted to dissuade me from taking it. They said it would be too hard, that I should just wait for college. But students don’t always need to wait. I felt prepared, so I put my foot down and decided to persevere. That class was one of the most challenging that I have ever taken. 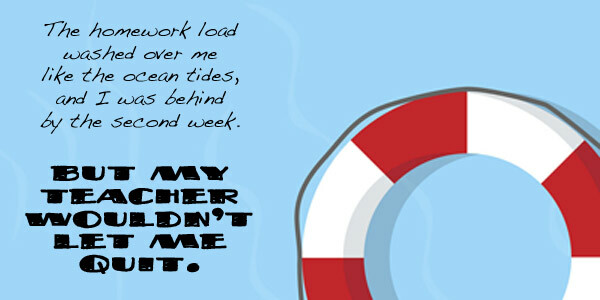 The homework load washed right over me like the ocean tides, and I was behind by the second week. Our study groups turned into neighborhood band practice, and I was failing far worse than I ever had in anything. But my teacher wouldn’t let me quit. College professors won’t do the same thing this teacher did for me. From working one on one to extending deadlines and offering exceptions and alternate assignments, it was the nicest thing that she could do for me. That was the year I learned that college isn’t something easy. At the end of the year, most of us did not pass the test to get college credit. Because of everything my dedicated teacher did for me, however, I earned a 3: the lowest passing grade. Even though the class grade in AP is not the grade that counts for your college credit, they have to assign a large quantity of homework assignments to ensure that you understand the material well. On the other hand, Concurrent Enrollment (CE) credits are a whole different ballgame. In CE courses—which are taught at your high school by a college-approved teacher—you are considered an actual college student, and they expect you to understand this. In CE classes you spend a lot more time discussing things than we did in my first AP class. Instead of giving you homework to make sure you can pass many different versions of a standardized test, you get to discuss ideas and ask analytical questions that will end up on the test at the end of the semester. Your teacher writes the test, or receives it from the college, so he or she knows exactly what you will need to study and communicates this to you beforehand so you only have to study that material. There are many similarities between these two avenues of high school-college interaction. For one thing, the students in these classes are all high-level thinkers and want to be there. AP and CE students should also have certain academic abilities, analytical thinking being the most important. If you don’t know how to think analytically, you won’t be ready for these classes. The main difference between the two is in the way credit is earned. In AP, your college credit is only earned based on a final test. In CE, your grade is the grade you get through the college. The other way to earn college credit in high school is through early college courses. Some of these credits are earned through summer semester programs, and some are taken during home release or special college periods. At my school we can take classes at the local trade schools like Marinello (a beauty school) and the Technology College. These classes are available to seniors and are an excellent way to get ahead and earn college credit. Unlike CE classes, you don’t have the advantage of a high school teacher as an instructor. This is the real thing. You even go to their school to attend these classes. I have accrued many credits through these early college options. I could graduate with my associate degree, which is definitely the right direction for some students to take their high school career. Whatever is right for you, I simply suggest you consider the options available to you. Have fun senior year, but get as far ahead as you believe you can! Camille has always loved to be creative. She enjoys writing and is excited to become an English teacher. She has been published in an anthology of high school poets in the United States.